Good question. Shaper says that it’s to allow you to play guitar with a drumstick or similar. You fret chords in (approximately) the same way as you normally would but you’ve got the strings facing you at the bridge end so you can bang them with stuff. 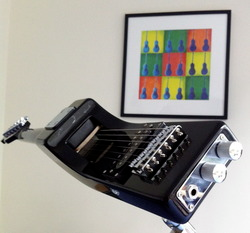 This design means it’s necessary to mount the Jasperbridge on a stand before you can play. Shaper reminds us that a number of famous guitarists have played guitars with drumsticks—he names Buddy Guy and John Mayer—and he reckons that his guitar can open a new world of percussive guitar music. I’ve seen Buddy Guy play his regular Strat with a drumstick on a few occasions (live) and it was pretty cool. Thing is, he did a fine job of it on that regular Strat. So fine, that I’m not immediately sure of the point of the Jasperbridge. I can see how you’d get a different ‘feel’ by striking the strings back there and it might feel more natural to a drummer. From a guitarist’s point of view though, the left-hand position appears unnaturally ‘curled’ back and looks awkward. Perhaps in reality, it’s all fine and natural but I tried experimenting by tilting my own guitar into that position and it felt uncomfortable. Maybe that’s just me, though, and if this floats your boat, you can buy a Jasperbridge from their site. They’re currently listed at US$525. What do you reckon? Innovative genius or answer to question only one guy asked? Definitely the answer to a question only one guy asked but answered in funny, and inventive kind of way :) Nice catch ! The guy clearly enjoys playing it and it obviously fills a niche for him. I don’t quite get it, but I certainly wish him luck. I love inventiveness, even (especially?) when it appears weird to me. It seems the link you provided points to the YouTube video that’s embedded above. If anyone would like to see more, try popping to http://myjbridge.com/home.cfm. The home page and the About page have additional videos of the Jasperbridge in action.